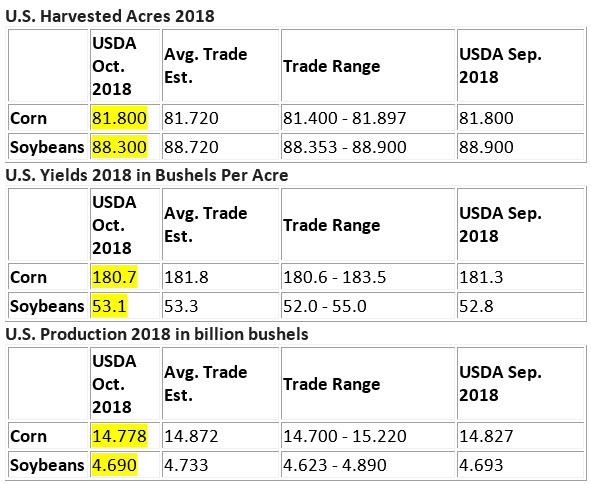 The USDA released the Oct WASDE at 11am central and the report is less bearish than expected, which is causing a modest rally in the grain and oilseed markets. CORN | Corn yield was adjusted LOWER to 180.7 from 181.8 last month. While new crop production is estimated lower, old crop stocks were raised by almost 140mm bushels. The market was expecting the larger old crop number because due to last months Sept quarterly stocks report. New Crop ending stocks did INCREASE so that is technically bearish, but it did not increase as much as feared, hence the rally. WHEAT | Wheat was neutral as the USDA did not make many changes to the US or the World numbers. The bulls will be disappointed as they want to see lower global production and more US export demand. MAIN TAKEAWAYS | This report is moderately bullish for corn. A close above $3.70 could push prices to $3.75. At that point the market still has to consider we have a 1.8 billion carryout and corn supplies do not need to be rationed. The way past $3.75 will need very good export announcements and/or harvest delays/losses. This report is neutral for soybeans. 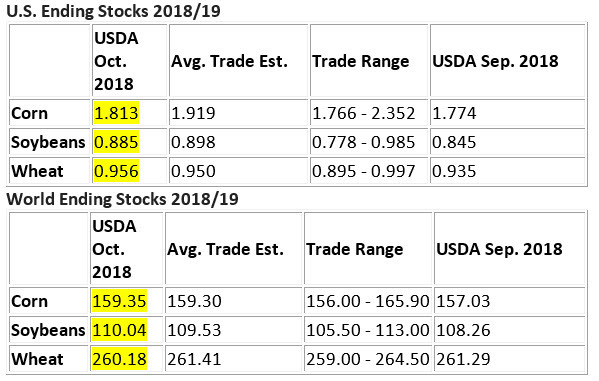 885mm ending stocks will cap soybean rallies until we replace the export demand we lost from China AND we see a reduction in US soybean acres. For now soybeans will be range bound, but the range will be large. High $8s to low $8s until something changes materially with tariffs or acres.